Winter is past, and it’s time to complete that to-do list of outdoor chores. But don’t forget to add “take care of roof” to that list. The weather we’ve had this past winter in Indiana could easily have left a damaging mark on your shingles or gutters. Thus, with that in mind, we have put together a spring cleaning checklist for roofs. Tree limbs commonly cause issues when they grow too close to a roof. If limbs hang over your roof, for example, it’s possible the limbs can break and damage it. Limbs damage a roof, too, even if they don’t break. Leaves and twigs can rub shingles, loosening the shingles and rubbing off granules (the gravel-like covering on shingles), can can lead to water damage. Because of the dangers involved with trimming trees, consider hiring a professional arborist to cut back vegetation that threatens your roof. Homeowners commonly neglect to clean their gutters during the winter. While understandable, this can lead to the gutters over-filling in the spring. Blocked gutters cause serious damage to your home. Because water is unable to flow properly away from the roof, the water can rot the roof’s substrate. And if water isn’t flowing down the drain spouts, it may pool and freeze by the foundation and eventually damage it. What’s more, clogged gutters make a nice nesting area for pests, some of which include disease-carrying insects. Mold and moss on a roof may not seem dangerous, but these organisms feed off the shingles and slowly destroy them. And the damage they produce doesn’t until they are removed. Killing the moss and mold with chemicals and is essential, therefore, to increasing the lifespan of your roof. Harsh weather in any time of the year can lead to missing or loose shingles. 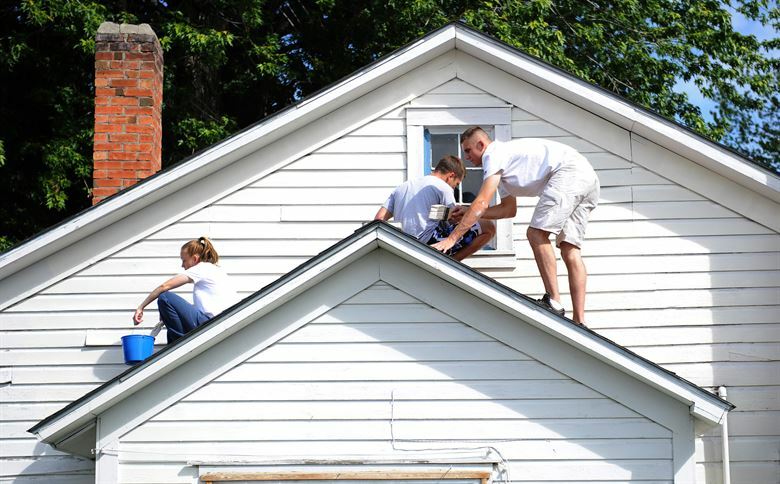 While a few missing shingles may not seem like a big deal, there are hidden dangers if these shingles expose the roof structure underneath them. Just one missing or loose shingle gives water the ability to enter the home and damage walls, ceilings, and electrical systems. It can also spark fires if it causes the electrical system to short. If water runs into the ceiling and walls, it can invite mildew and mold, too. And once mold sprouts, it won’t stop. It will spread throughout the house by means of the HVAC system. Mold is especially problematic because of health concerns that arise when it’s present. Mold is known to cause allergic reactions, asthmatic symptoms, and other health concerns when left untreated. Chimney flashing is a metal sheet that creates a waterproof seal between the house and the chimney. A damaged or improperly installed chimney flash, however, will pull away from the roofing material, which will lead to water leakage. Water spots by your chimney or fireplace indicate that the flashing needs replaced. If you notice damage during your spring inspection, do not wait until things get worse. Protect your family from the dangers just above your heads. Call E3 Roofing & Remodeling to schedule your free inspection.